Specify cellulose insulation in walls and attics to add sound control to homes & buildings. Homeowners who choose cellulose insulation get the added value of effective sound control. It is widely used to help limit exterior noise intrusions as well as for limiting noise between rooms. 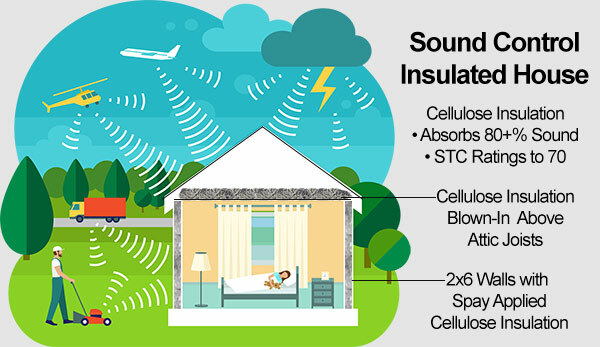 Understanding how cellulose insulation can help control sound provides insight into this important performance feature that can help to limit noise from outside or between rooms inside the home. Sound Transmission Class measures the sound transmission between spaces. A single number rating is used to measure a structure’s ability to impede sound transfer. The higher the STC rating, the more effectively a wall, floor or ceiling controls sound transmission. Noises can be heard through a wall with an STC rating of 30 but should be much less audible through a wall with a rating of 60. Cellulose Insulation may be used to achieve STC ratings as high as 70 depending on the wall or partition assembly where the product is installed. Using cellulose insulation can control sound from outside a home or building and between rooms when added to interior walls. There are many applications including even helping to make garage home recording or music rehearsal studios more sound proof.